Updated Friday May 4, 2018 by Web Administrator . NEW TEAMS in the following age brackets: (birth year, Gender, Age bracket) Register for these teams at the Rhinebecksoccer.com website. 2007 Boys Under 12, There is an existing team in Red Hook that is looking for a few players. If there is enough interest in this age group a second team may form. 2007 Girls Under 12 If there is enough interest in this age group a team may form. Girls may also indicate that they are willing to play on a Co-ed team in the boys division. 2006 Boys Under 13 There is an existing Red Hook Team that will play in the Fall and Spring. They may have space for a few players. If there is enough interest for a second “Sundays only team” for modified players one may form. All players in this age group that want to play in the fall should attend the tryouts. Additionally, there will be a Spring Only tryout at the end of the fall season. 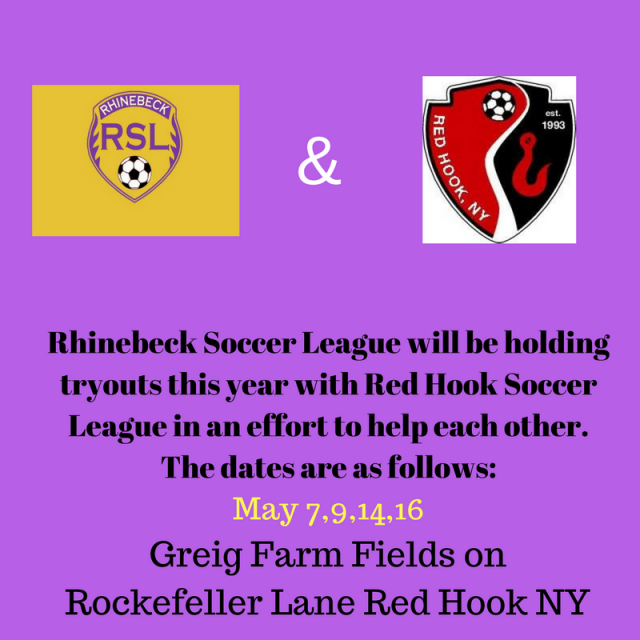 Rhinebeck Raptors 2004/2005 team will NOT play in the fall so: We will know in the next day or so if the 2004, and or 2005 Red Hook teams will be looking for players. If there is interest a Spring only team may form. This joint effort is being made to try and provide as many team opportunities for both club’s players as possible. We will hopefully be able to form teams in several age groups that have not been served for years! I will send specific tryout times as soon as they are available to the REGISTERED PLAYERS. So, please register for the fall 2018 tryouts ASAP. Please email michaeldecola@gmail.com if you have further questions.